The corruption trial of former Illinois governor Rod Blagojevich started this morning, but he fired the first salvo before even walking in the front door. It missed. 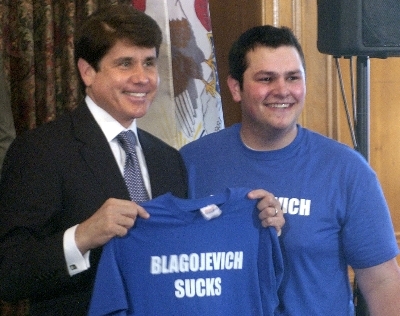 His lawyers filed a motion prior to opening statements arguing that Blagojevich had the right to say the things that he was recorded saying because, far from misusing his office for personal gain, he was just talking politics. Blagojevich had "the right," the motion argues, "to vigorously debate about different options for appointments and different fundraising strategies." And because "[t]he marketplace of ideas is critical to Democracy [sic]," the prosecution "violates fundamental free speech." I just wonder if "marketplace" was the best metaphor to use in association with Rod Blagojevich. Let's see — so, when Blagojevich met with a lobbyist in 2008, mentioned that he was about to announce a $1.8 billion construction project and said "I've got Lon going to Construction Executive and asking for $500,000 . . . . I could have made a larger announcement but wanted to see how they perform by the end of the year. If they don't perform, f— 'em," he was simply engaging in vigorous debate about a fundraising strategy. See United States v. Blagojevich, No. 08 CR 888, Government's Evidentiary Proffer, p. 55 (filed Apr. 14, 2010). Or, when told that Children's Memorial Hospital (which was hoping for a rate increase) was not returning calls about political contributions, Blagojevich said "Screw them," then called the deputy governor, asked "Where are we on the money to Children's Memorial Hospital? . . . . Hold it up," that was an even more vigorous debate about fundraising. See id. at p. 62. Or, when discussing whether to name "Senate Candidate A" to Barack Obama's vacant Senate seat, Blagojevich said "there are tangible things" that would have to happen in order to get that appointment, and when asked what those were, he responded, "tangible, concrete tangible stuff from supporters . . . Specific amounts and everything," that there is also an example of the marketplace of ideas and stuff. See id. at p. 88. But we'll see how that argument plays out. Speaking of free speech, Blagojevich has also started a Twitter account and will apparently be tweeting updates from the trial. His Twitter handle is @GovernorRod, which, ironically, is itself technically a false statement. The @GovernorRod Twitter feed (like the trial itself) should be continuing comedy gold, so expect to see more updates as the trial continues.